As of this week, the ramp from Woodmont Avenue has been relocated to Wisconsin Avenue for the mass excavation and hauling operations. In the near future, blasting of bedrock may be required for which advance notice will be provided. 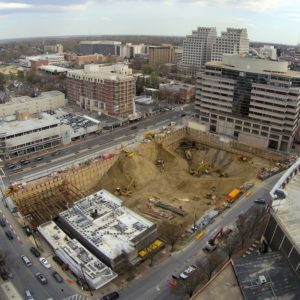 It is anticipated that the mass excavation and hauling operations will continue through July with concrete operations beginning in mid-May. Meanwhile, underground utility improvements and restoration work continue to move northbound along Woodmont Avenue toward Norfolk Avenue. This work, which includes stormwater, sanitary and domestic water lines, is anticipated to continue through July. During this time, two-way traffic will be maintained as often as possible with temporary steel road plates in use as needed. 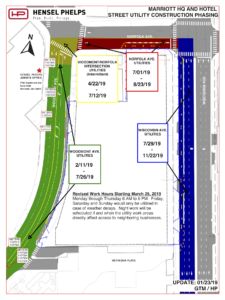 The timeline for all upcoming phases of this work is estimated in this site plan, including future phases along Wisconsin and Norfolk Avenues. Please note, this plan does not include anticipated work performed by Pepco. 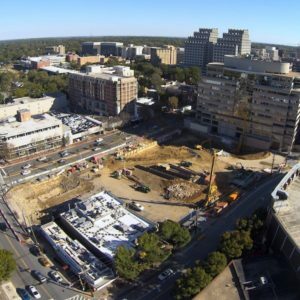 As the development team’s revised schedule for all noise-related construction activities has begun, the impact on neighboring residents and businesses, as well as commuters passing through the area, has been minimized. Coverage of the schedule adjustment had been featured in Bethesda Magazine. 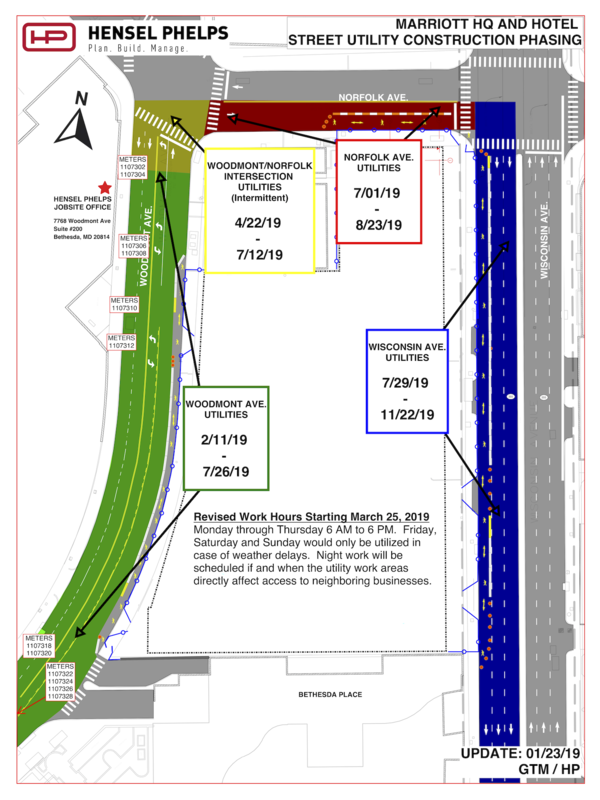 This revised schedule includes traffic control operations starting at 6 a.m. and work occurring between 7 a.m. and 6 p.m., Monday through Thursday, along with brief, less-intrusive activities during lunchtime hours from approximately 11:30 a.m. to 1 p.m. While the main activities will occur during these hours, certain portions of the work will need to occur during the overnight hours from 6 p.m. to 5 a.m. In the case of inclement weather, work may take place Friday through Sunday. Throughout this project, the approved Montgomery County and State Highway traffic control plans will ensure minimal impact to traffic flow around the site. Meanwhile, sidewalk closures remain in place along sections of Woodmont, Norfolk and Wisconsin Avenues (view map of closures here), and additional temporary closures may be necessary during this time. Pedestrians will be detoured to the east sidewalk of Wisconsin Avenue during work hours and should take advantage of nearby crosswalks as needed. Please be vigilant and pay close attention to signage as detours may change occasionally. Our number one priority is the safety and security of pedestrians and commuters in and around the construction site. The next update will take place Tuesday, June 4, at 6:00 p.m.